It is an announcement-only list, not intended for discussion. To subscribe, enter your e-mail address in the box below and click "Join Now!". 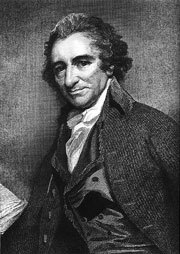 The first goal for this site is to become the largest single archive of works on or about Thomas Paine on the World Wide Web. The second stage will see it become the most comprehensive ie. it will ultimately include everything that Paine is known to have written. The text of Common Sense can be found here. The text of Rights of Man can be found here. The text of The Age of Reason can be found here. Kenneth Griffith's documentary on Thomas Paine - The Most Valuable Englishman Ever. Somehow, this documentary crept past the BBC censors and was broadcast in 1982. All requests to the BBC for a repeat have so far been ignored. A collection of books about survival, available for download as ZIP files. by Carl A. Wickland M.D. THIS WEBSITE tells the true story of a Scottish housewife who found herself in the centre of a WWII legal battle which ended with her brutal conviction of a 'crime' under Britain's ancient Witchcraft Act and jailed for nine months simply for falling asleep on request. Her name was Helen Duncan and in every respect but one she was just a normal housewife and mother of six. That single aspect that made her different from others and was destined to make her the confidante of wartime premier Winston Churchill and his colleagues is that she had the astonishing ability to bring the dead to life. Mrs Duncan was a Spiritualist Materialisation Medium through whose ample body milky ectoplasm flowed and formed into complete human figures which could walk and talk and greet their living relatives with intimate secrets know only within their families. This is the true story of a woman sent to prison accused of being a witch when she was a well-known and proven psychic. During WWII Helen's accurate 'death notices' were verified countless times. When she materialized the full form of a sailor with the name H.M.S. BARHAM on his cap, a ship, which the English government denied had been sunk; she was arrested and jailed as a spy and then a witch. Even after she was proven correct, she was held as a witch. Her story is still unfolding today and is documented here. This web site is the OFFICIAL home for news about Helen and the attempts to clear her name. The British Society of Paranomal Studies has embarked on the legal efforts to have Helen granted a posthumous pardon. "Truth is born into this world only with pangs and tribulations, and every fresh truth is received unwillingly. To expect the world to receive a new truth, or even an old truth, without challenging it, is to look for one of those miracles which do not occur"
(from an interview with Wallace published posthumously in 1913). Once a particular Christianity - hierarchical and authoritarian - became wedded to the Roman state, it became a force of brutal repression. This so-called 'orthodoxy' suppressed and persecuted its 'heretical' opposition. A triumphant Christianity was the active agent in destroying knowledge and access to learning. An ignorant and impoverished population was more readily subjugated by Princes of the Church. The cost to humanity of fifteen centuries of Christian savagery - of hundreds of millions of lives brutalised and truncated, sacrificed to war, torture, pogrom, burning, pestilence and plague - is incalculable. "For nearly two billion people, the Bible is a holy book containing the revealed word of God. It is the source of their religious beliefs. Yet few of those who believe in the Bible have actually read it. This must seem strange to those who have never read the Bible. But anyone who has struggled through its repetitious and tiresome trivia, seemingly endless genealogies, pointless stories and laws, knows that the Bible is not an easy book to read. So it is not surprising that those that begin reading at Genesis seldom make it through Leviticus. And the few Bible-believers that survive to the bitter end of Revelation must continually face a disturbing dilemma: their faith tells them they should read the Bible, but by reading the Bible they endanger their faith. The Skeptic's Annotated Bible attempts to remedy this imbalance. It includes the entire text of the King James Version of the Bible, but without the pro-Bible propaganda. Instead, passages are highlighted that are an embarrassment to the Bible-believer, and the parts of the Bible that are never read in any Church, Bible study group, or Sunday School class are emphasized. For it is these passages that test the claims of the Bible-believer. The contradictions and false prophesies show that the Bible is not inerrant; the cruelties, injustices, and insults to women, that it is neither good nor just." NEXUS is an international bi-monthly alternative news magazine. NEXUS Magazine is not affiliated with any political, religious or spiritual groups or organisations, and has been published since 1986.